The Fire Prevention Division was organized in the early 1960’s. This division currently consists of six personnel: an assistant chief, a captain, a lieutenant, two inspectors, and a fire and life safety educator. This division is responsible for keeping the community safe by means of building engineering, plans review, fire and life safety code enforcement, and fire and life safety education. This division is also responsible for performing fire origin and cause investigations when needed. This municipality contains more than 3,000 commercial business occupancies. The Fire Prevention Division is responsible for inspection and enforcement of fire and life safety codes within the new and existing structures to ensure that the fire and life safety components are in place and working properly. Some of the components are: building construction, a means of egress, exit and emergency lighting, fire extinguishers and automatic extinguishment systems, smoke detection and notification systems, and any life safety hazards. Our job is to educate the public on these hazards and to ensure that the hazards are repaired or corrected to protect life and property. When called to do so, the Fire Prevention Division performs fire origin and cause investigations on fires within the municipality. An Inspector is called in to investigate a fire if the fire suppression crews are unable to determine the cause, the fire is probable incendiary, or there is a death or injury from the fire. This investigation will consist of working to try and determine area of origin and point of origin, establish a cause, take photos, and perform interviews. If the investigator determines the fire to be probably incendiary then they will work to assist the Warner Robins Police Department with the criminal investigation. The Fire and Life Safety Education Program was implemented in 1980. Warner Robins was one of the first in the state to have such a program where fifth grade students in the public school system were taught fire safety. Today our fire safety education program is taught in 19 schools to all fourth grade students, as well as a program for all pre-k students. In addition, our pre-k program is also taught at the day cares in our community. During fire prevention month, station tours are conducted as well as a puppet show being performed at 19 elementary schools. This year we reached 11,240 students during fire prevention month. Another life-saving tool that the Fire Prevention Division uses is the fire safety house. Our department was fortunate to acquire two houses through grants. These tools are used in teaching children how to escape from a smoke filled room, as well as the importance of having a meeting place outside of the home and how to call for help. Our division is also involved within the community by providing demonstrations and training at different events throughout the year. In addition, we provide fire extinguisher and fire safety training upon request. How do I refill, recharge, or check my fire extinguisher? 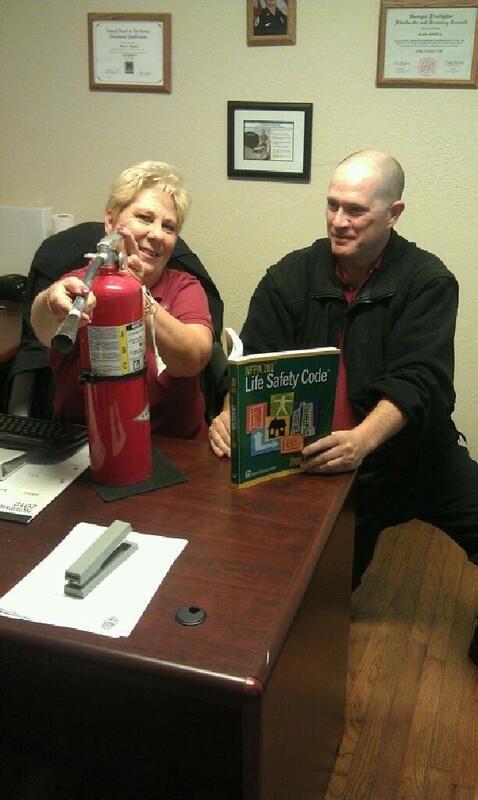 Do you give fire extinguisher training to local businesses?